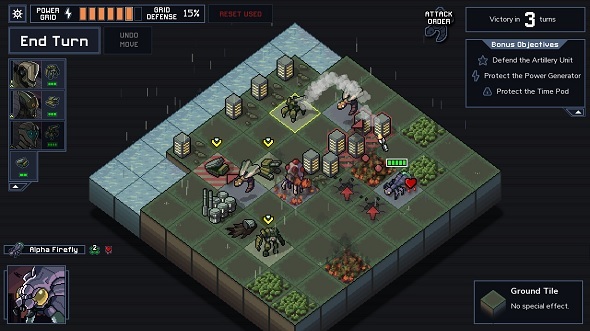 Into the Breach is like a turn-based Pacific Rim. It is your own personal Kaiju playset. You lead a small force of mechs and tanks against huge alien insects that are threatening humanity’s last cities (although you only have to move your legs and arms in real-life if you choose to). 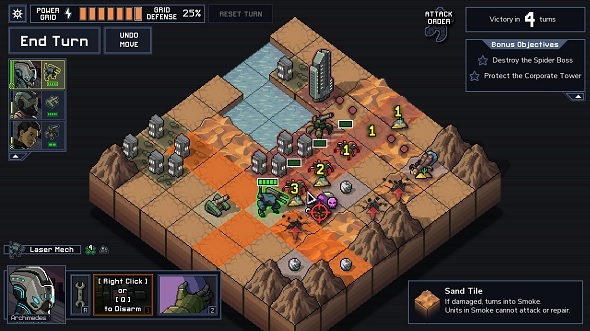 Subset Games’ follow-up to FTL is an excellent tactical game, but under its chunky Advance Wars aesthetic, Into the Breach does something special: it pushes you into the role of a hero, teaching you to both protect and sacrifice. It doesn’t fire this at you through its story alone but mounts an additional double-barrel to the effort with its systems and mechanics. 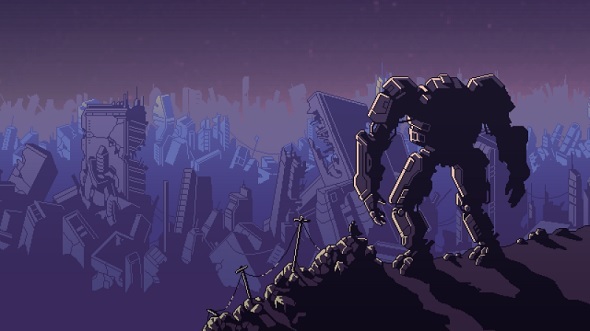 Could Into the Breach make it into our list of the best indie games on PC? Every Into the Breach level is a small grid dotted with mountains, forests, and cities – a landscape in miniature. You and the enemy AI pick starting cells for each of your soldiers/bugs and then take it in turns to outmanoeuvre and smash each other up. It is an intricate challenge. 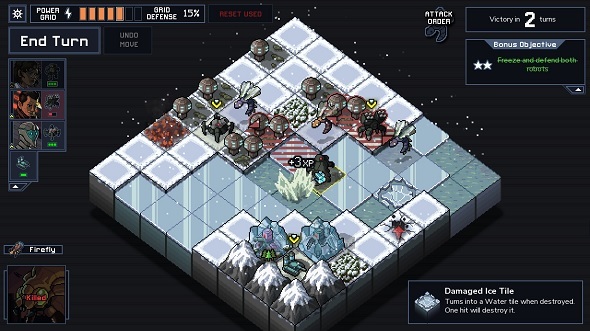 There are no surprises in Into the Breach’s combat – you are always told exactly what the enemy will do on its turn. They move into position, line up their attacks, and then it is your go – you have the chance to counter before their attacks land. As such, you can dodge out of the way, shove enemies so their attack misses its target, or even move an enemy so their attack now threatens one of its allies. You have three units in your squad and each of them has a weapon that behaves uniquely. As you complete achievements on your runs of the campaign you can unlock different squads but your starting squad is built to shove your enemies around the board. You have a mech with a powerfist that hits enemies on adjacent tiles pushing them back one space. There is also field gun that can fire an artillery shell the full length of the map and that will cause one damage if it lands on an enemy, while also pushing any units next to the explosion back a space. A third is a fast-moving tank that can fire a shell that both damages and pushes back any enemy it hits. In every turn, you have to assess when the enemy will attack and how you can best use your troops and their weapons to keep them safe. Every level of Into the Breach has a countdown, a set number of turns after which the aliens will abandon their assault and leave the zone. You don’t need to kill every alien to win; you just have to outlast them. However, you don’t get points for surviving an assault, you only get resources for completing bonus objectives. You will often have two or three to complete within the time limit – defend the power generator, destroy the dam, kill seven enemies – and it is perfectly possible to complete missions without earning any rewards. You need those resources to upgrade your units, extending their abilities, though. Your mech’s powerfist can be upgraded letting you charge in a line across the grid before punching an enemy, for instance. So, while you can limp through missions outlasting the enemy and not completing objectives, it will leave you seriously underpowered later on. The most important resource in Into the Breach is your power grid. It is essentially a health bar that persists between missions and will put an end to your campaign should it reach zero, meaning you must start afresh. The power grid is the heart of Into the Breach. It is the power grid that forces you to become a hero. In many games, buildings represent little more than scenery, obstacles to block your vision, or props to crumble satisfyingly as you battle between them. However, in Into the Breach every one of them is important. They are not only full of civilians who celebrate your arrival at the start of the mission – with little speech bubbles of encouragement, such as ‘We’re saved!’ – each of them is an energy cell on your power grid. Therefore, if they ‘die’, you get closer to death yourself. You will quickly learn to recognise the need to protect buildings, pushing insects out of the way when they threaten to destroy a tower block. What takes a little longer – at least for me – is recognising the disparity between the buildings’ health and that of your troops. Buildings can take a single hit, whereas your soldiers, particularly your mechs, can take multiple hits before the pilot is killed. Often there will be times where you cannot move every alien away from destroying a tower block, but you can place your soldiers between the aliens and civilians, soaking up the damage instead. Your choices are more substantial because you always know what the enemy is going to do on its turn – you are aware of who you are letting be hit by the enemy’s attacks, be it soldier or civilian. You are responsible for every undeflected death, but also every life saved. So, yeah, play Into the Breach.